Creative director and entrepreneur Alexander Stutterheim founded Swedish premium fashion brand Stutterheim Raincoats in 2010, creating fashionable and functional raincoats and jackets of top quality and ageless designs. 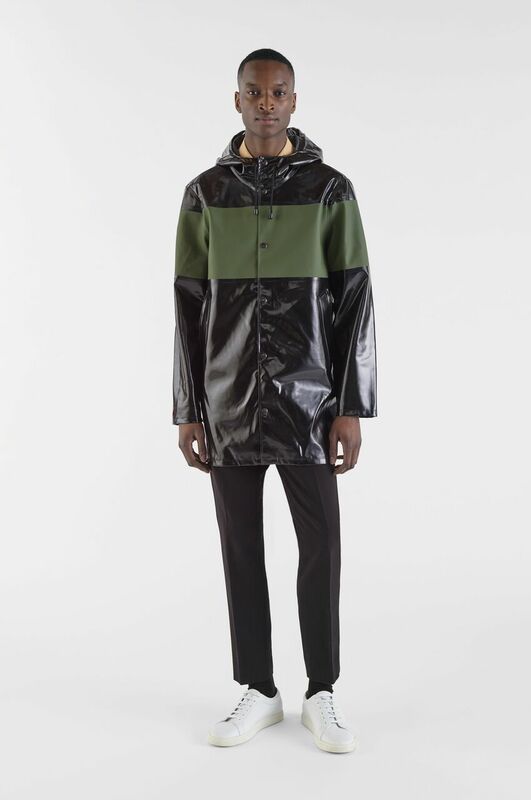 Inspired by Alexander´s grandfather and his traditional 1960´s Swedish fishermen’s raincoats, Alexander recreated the classic designs with a contemporary and simplistic twist to accommodate today’s metropolitan style. The first 200 raincoats was designed and hand sewn in his own apartment, and the brand quickly went from a company of two to having employed over 20 skilled people, now working from trendy Södermalm area of Stockholm. Each product is thoughtfully handcrafted, 100% waterproof and designed for both women and men. The timeless coats are made to last for many years, thus working against the wear and tear mentality of the fashion industry. Today, Stutterheim has been praised across the world by the likes of Kanye West, Julia Roberts and Jay Z, to mention just a few and has had several successful and sold out collaborations with Marni, Henrik Vibskov, Alpha, Volvo, and many more. Stutterheim is now available at more than 1000 retailers world wide, including Barney’s New York, Dover Street Market, Isetan and Le Bon Marché. Stutterheim also has two flagship stores, in Stockholm and in New York City. My granddad was a wonderful man. He often went out fishing from Arholma (an island in the Stockholm archipelago) during stormy weather and then, later in the evening, he wrote poems and managed a big theatre in Stockholm. He scared me to the bone every time he set off to sea to catch fish (or life, as he said), defying the worst weather, the heaviest rains and the loudest of thunderstorms. It was just recently that I discovered his old rain coat in an abandoned barn. At that moment, old memories struck me and I instantly wanted to wear his coat. It was both stunningly cool and very practical (although as big as a tent). With great care, I brought it back home to my kitchen and imagined it in an updated, contemporary version. A homage to my granddad, and the quest for life. After my discovery, I went out to buy a piece of oilcloth. I put it on the kitchen floor and cut out a design using the old coat as a pattern. I showed the sample to a couple of friends. And after some improvements, there it was – the 60‘s raincoat from the archipelago, updated to fit the modern man and woman. I brought the prototype to the last standing textile factory in Sweden, in the small town of Borås – rainwear has long since been engulfed by the sportswear industry, and production moved to countries with lower costs far away. As soon as I met the manager, Johan Käll and the seamstresses, Birgitta and Lena, I knew they were the right people. A perfect match. With their skills, craftsmanship and great attention to materials and detail we realised our raincoats should be handmade. A great way to honour my grandad's durable and practical raincoat. And there it was. The coat. With all its seams taped and sealed. In the very best quality; handmade and with a discreet, classical cut. The first 200 coats – Arholma Svart – were made and sold in my apartment. Each coat was signed and numbered by the seamstress (they still are) to really make sure the quality matched the very highest of standards. After a couple of months, (when my neighbours became suspicious of all the people in black coats) I had to move my business to another location. The new store, showroom and headquarters, in which I wrote this text, became our very own venue for experiments within the realm of rain and darkness. And from now on, it’s here where every new idea and product is born. I am very happy (although I am melancholic from time to time) that I have managed to give new life to my granddad’s old coat. A coat to wear out in the countryside, at the sea or just when strolling around the city. To be well-dressed, even in bad weather conditions, is now possible. I truly hope that you will follow this wonderful project in the future. Welcome to embracing the demons lurking outside and those hiding within.